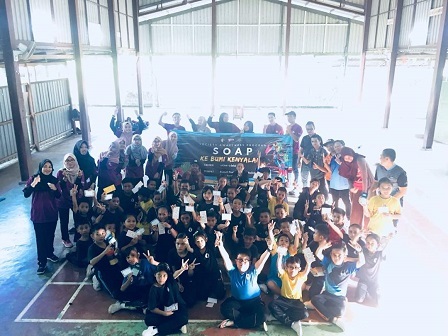 KAPIT - The Student Council (MTM) of the Sixth College, Universiti Putra Malaysia recently visited Kapit, Sarawak to take part in the Society Awareness Program (SOAP) KeBumi Kenyalang. SOAP Ke Bumi Kenyalang chose the Nanga Banyau Balleh longhouse located in the district of Kapit as its preferred destination. SOAP focuses on giving exposure and creating awareness of the diverse lifestyles, cultures and religions to the community and students, and it is a continuing programme that has been conducted in several different locations. 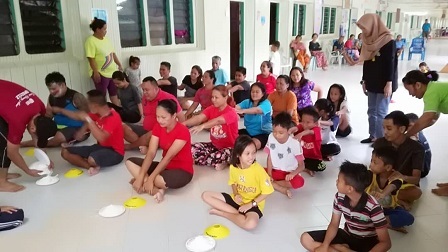 Programme Director, Nur Aqilah Azian, said the selection of Kapit as the programme location helped achieve the objectives of the programme which were to create awareness and share knowledge through the various activities carried out with the longhouse residents. She said the students were very happy throughout the programme with the community as they were able to gain lots of new experiences while getting acquainted with the longhouse community. Nor Raihan Ramli, a participant of the programme, said SOAP Ke Bumi Kenyalang journey to Kapit was quite challenging as they had to use various types of transportation. "We started our journey by taking a flight to Sibu which took about an hour and a half and travelled for about 45 minutes in a Grabcar to Sibu Wharf Terminal, followed by a three-hour trip to Kapit on an express boat along the Rajang River before boarding a van for another 45 minutes. Then we took a 5-minute boat ride to get to Rumah Panjai Nanga Banyau Balleh," she said. 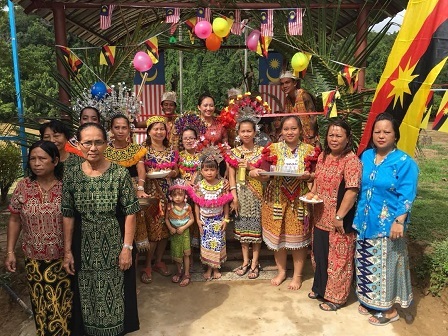 The arrival of the students to the longhouse was celebrated with a miring ceremony performed in conjunction with the closing of Gawai and the official launching of SOAP Ke Bumi Kenyalang. During the ceremony, students had the opportunity to experience Iban customs such as the Ngajat dance that circled the ranyai and the ngiling bidai (rolling the mat) ceremony that marked the end of the celebration and readiness to face a new year. The ceremony was attended by the Pelagus State Assemblyman, Wilson Nyabong Anak Ijang, who also officiated the newly built iron bridge for the convenience of those travelling to Nanga Mujong School. Various activities were conducted throughout their stay at the longhouse. The ‘Kenali Kapit’ (getting to know Kapit) slot provided students with the opportunity to perform ngabang i.e. visits to other longhouses. Through the Selusuri Bumi Hijau Kenyalang (strolling along the green Bumi Kenyalang) slot, finding snails in Banyau River and catching lokan (clam or a type of shellfish) activities were carried out with the local community. Meanwhile, Rasa Sayang Malaysia (Love Malaysia) slot was carried out through rewang (community volunteerism) and sharing of foods from the peninsular and Sarawak such as fish and chicken pansuh (fish or chicken cooked in bamboo), lokan bakar (grilled clam) and sambal belacan or shrimp paste (from Kapit) and asam pedas (sour and spicy fish stew dish), kerabu magi (noddle salad), onde-onde and manisan puteri mandi (sweet kuih) from the peninsular. Salam Lebaran celebration (Eid al-Fitr celebration) was also held with the longhouse residents. A variety of festive delicacies such as ketupat, lemang, kuah kacang (peanut gravy), nasi impit (compressed rice), kuah lodeh (mixed vegetables cooked with coconut milk) cooked by the students themselves and cookies brought from the peninsular were served. Children in the longhouse also received duit raya (token of money). A special programme with children was also held at Sekolah Kebangsaan Nanga Mujong. A teacher at SK Nanga Mujong, Muhamad Fadzlan Saaidin, said the students were very excited with the visit and eager to take part in activities such as Kids Expression, Language Sharing (English and Malaysian 'Loghat' or dialect) and Kids Appreciation. A Bachelor of Science in Cell and Molecular Biology student, Muhammad Faiz Abdul Manab, said SOAP Ke Bumi Kenyalang exposed him to new experiences as it was his first visit to Sarawak and a rural area such as Kapit.